Collection of observations and encountings with hominoids is used to determine the range, where primates of alamas and similar species presumably inhabit. The detailed descriptions of yet unknown Himalayas’ primate obtained from photos by A.A.Tishkov [1,2], allow to turn to other encounters and observations of hairy hominoids in various areas of Eurasia. The analysis of these records allows to mark out from observed creatures such specimens, which can be referred to creatures as similar or near to alamas, and allows to outline roughly the actual area of their inhabitance. Experience of highland Himalayan inhabitants (Sherpas a.o.) and information received by special expeditions into the area in middle of last century  affirms that there are yeti of two kinds. They differ considerably in height and are named differently. The largest of them, in Sherpa named as DZU-TEH, are from 210 to 240 cm tall. The smaller ones - MEH-TEH usually do not exceed 180 cm in height. By the same observations these kinds are different not only in heights, but also in some other attributes and behavior, so with high probability they represent different species. As A.Tishkov had estimated, the height of the hominoid, photographed by him, Alamas alamas does not exceed 140 cm and due to this feature attribute it is the representative of short yetis. In  the detailed images of alamas were received. But in most cases only general features of objects were got. They usually are expressed verbally only. Even in cases, when corpses and other traces were found by people, no measurements or saving of samples for the future researches were made. So it is difficult to estimate affinity of the hominoids found in different areas and in various conditions. It is possible to admit only that they are somewhat similar. Therefore, in the present research of area where probably alamas live the height of creatures in observations was selected as main criterion, just the height beneath 180 cm approximately. Obviously different species are observed frequently in same territory. If in such cases the observer did not specify the height of the seen creature, the records are excluded from consideration, as a rule. On the other hand, the creatures of about one meter or less height were not considered also, because they, most likely, do not belong to Alamas alamas. Besides selection by height, I took into consideration, when it was available, the following morphological features of alamas - low strongly sloped forehead, absence of long hairs on the head, and also unusual for human and known apes pointed up and, apparently, capable to turn external ears. The described below selected records are reduced for lack of article space. Results of expeditions which have been carried out in 1950-th and 60-th  prove definitely enough, that such primates live through all Himalayas. 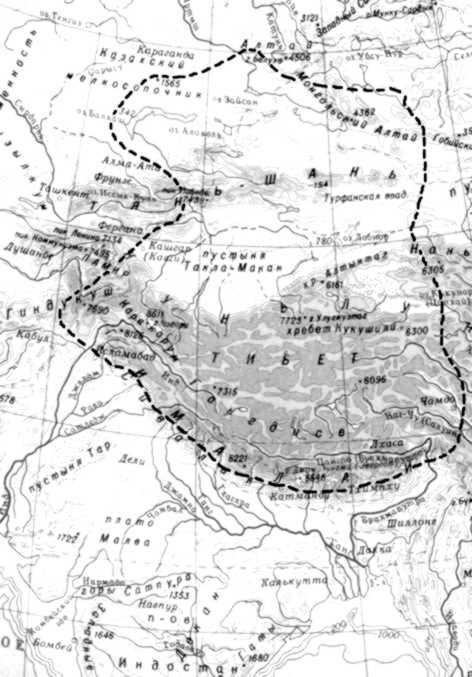 Northern borders of the area may be marked, apparently, by research of ksy-gyik in vicinities of lake Zaisan and Western China (comparison of alamas and ksy-gyik was carried out in ) , and also by communication from Semipalatinsk district in East Kazakhstan. Observation 1: the letter to Komsomolskaya pravda newspaper from witness-woman Aratovskaya. My grandfather Grigory Neskuba, 1882, lived near Novo-Shulbinka town in Semipalatinsk district area about 100 kilometers from railway station Shemonaikha. In 1920-th an interesting case happened to him. In an early morning his wife Nadezhda went to milk their cow and had found out, that it was milked dry already by someone. The grandfather decided to disclose, who had done that. And he saw a big animal which looked differently from anything he knew. It looked like dog, but was much larger and covered by red-brown hairs. The "dog" had seen him and run to a fence. It seized a fence by hands and gone over. Though in this case the encounter had compared the creature to a dog, the manner of overcoming a wall using hands (forward paws) allows to assert that it was a hominoid. Its size is appropriate to those described early. Let's recollect, that A.Tishkov had taken hominoid at first glance for a dog too. The case gives us the most northern point of the area. We have information from more Northern districts about tall hominoids only. To the West we have information on encounters with primates of considered type in vicinities of Balkhash lake and to the North from it in Kazakh Low Hills region. Observation 2: Told by geologist Larin on a Darwin museum seminar in 1977. In July 1965 we were driving by car around our work zone located 80 - 100 km to the North of settlement Sayar (to the North from Balkhash lake). All of us suddenly saw a strange creature at distance 70 meters, which ran on two legs in the direction of hills. When it moved away till 150 meter far from us, it stopped and looked at the people from under lifted hand and then had disappeared behind a hill. It ran bending itself and somewhat hopping along, but its hands did not touch the ground. All of us saw, that it had a humanlike face, not like snout of an animal. It was approximately 1,8 meter high by our estimations. It had no tail. Observation 3: From letter of Boris Resvantsev to professor P.I.Marikovski. It was on September 3, 1981 at evening twilights. I was in vicinity of Bektau-Ata mountain 60 km far from Balkhash lake. I walked back to our base camp. Looking aside, I had noticed a dark silhouette on edge of a flat rock. The first impression was that there an old man or old woman was sitting. This effect was due to pose of the figure - it was sitting with crossed legs motionless and, apparently, looking at me. It seemed to me, that the face color of the creature was lighter then other parts. Its body and hands were covered by something dark or black. When I raised my head next time for a look, I saw nobody at the place already. These messages show, besides confirmation of existence short hominoids in Kazakh Low Hills, the unusual pose of the primate was with crossed legs "like old orient person". As we shall see below, the researcher from Spain Georgy Marganer  had noted the similar posture for barmanu, alamas-like hominoid in mountains of Northern Pakistan. Observation 4: Out of the story of old Kazakh Marat from Ortoderesin settlement at Southern coast of Balkhash lake (recorded in 1983 by A.V.Kononenko). It happened in 1963 approximately. In the spring we drove our camels to a new place and at night had seen a "Shaitan" that was sleeping in reeds. In the morning we saw again, that the hairy man was lying there in the same position. It turned out, that Shaitan was knocked down to death by a camel. The appearance of Shaitan follows. It was a short man of approximately 150 cm height with proportional and regular body. It was fully covered by black and reddish hair. It had very strong and protruded chest, muscular shoulders, arms, back and other. It is very strong. There were hard callosities on elbows and knees. The foot is wide, callous, and the thumb was set aside. The head was covered by hair 10-15 cm long, but there were no hair on its face. The forehead was very sloppy with large eyebrows. The nose was slightly pointed upwards and flat. The lower jaw was shorter, than the same of a human. Cheekbones were wide. It is surprising a little in this description a short lower jaw of hominoid mentioned. Probably, a jaw without chin is the reason for such impression. The other part of the narration is in general agreement to the main features ascertained earlier for alamas and ksy-gyik. Farther to the West we have no information now about hominoids of the kind considered here. But from Western coast of the Caspian Sea through all Caucasus up to the Black Sea there are numerous observations of short (160 - 180 cm) hominoids, named usually as Almasty. These hominoids differ from Alamas primates because of a number of essential features. They have higher cranium then Alamas, more steep forehead, and long hair on the head, usually falling down onto shoulders. Proportions of Almasty's figure are closer to human. They apparently are different species of primate. Therefore in order to mark the area borders we shall move from vicinities of Balkhash lake in the Southern direction to Pamir. Observation 5: From message of geologist B.M.Zdorik. In 1934 I worked between Darvaz mountain ridge and the Western spurs of Peter the First mountains. Once on a research trek I came to highland meadow and suddenly a clear place as wide as a room opened in front of me. There on a small heap of soil a strange creature laid on its belly. It slept stretched in all length, i.e. approximately 1,5 meter or a bit less. I had time to notice legs with black soles, that were too long and slender for a bear, and flat back too. All body of the animal was covered by entangled hair. It was more similar to yak wool, than to fluffy fur of a bear. The color of the hair was brown-red. Sides of the animal moved slowly and rhythmically in sleeping. The guide with grimace of horror pulled me quietly to run away. There is information that on Pamir and especially in its east region inhabit both, high and short hominoids in the same places. Observation 6: Rosa Kuzmina had written a letter to Komsomolskaya pravda newspaper. In 1966 I was in expedition at Pamir near the state border in area near river Vanch. One of the frontier guards had told me, that that summer some traces of a trespasser once were found out on border. The traces led to a stack of hay. "Man" similar to a monkey had jumped out of stack and moved quickly to run away. As it was very difficult to catch it, they started to shoot and hit it. The frontier guard did not know where the corpse was buried. The next message is interesting because of some features of hominoids unknown before. Observation 7: G.A.Serebrannikov's letter to the "Commission on snowman study ", the USSR Academy of sciences. In December, 1930 he and a guide, the Tadjik by name Abduramon, rode at night through Vanch mountain pass on Pamir. There was a lot of snow. Once the narrator saw, that behind a snow heap a strange figure was staying and attentively looking at horses. The place was flooded by moonlight. The creature was neither a human, nor an animal. Snowman stood at distance 12-15 steps from them. Its height and proportions were those of a child of 14. It was seen up to its stomach only. Suddenly the right ear of the animal turned aside in attention. The ear quickly changed directions, as though listening the vicinities. The men led horses to the path. The snow man followed them, hiding behind rocks. They threw some bread to it and the creature lagged behind. The following message shows, that in the middle of last century hominoids were numerous enough on Southern borders of the USSR and in neighboring areas of close countries. Observation 8: the letter by F.F.Shultz to the "Commission on snowman study ". In 1949 near Tashkent his friends Tadjik agronomist and Afghan shepherd told me the following. On borders Pamir and Afghanistan hominoids came to boundary settlements from India and begged for some meal. We brought them out the fence fruits, bread, cheese, meat and milk. Their height was the same as ours, but wild people were more stooping. In 1987 Spanish researcher Jordy Magraner began his investigations in Northen Pakistan and collected many records about hominoid observations. In local language these creatures are referred as Barmanu. One of the records  in abbreviated notation is given below. Observation 9: The story by Purdum Khan, shepherd from Chitral district, who pastured his goats at heights 3500 m.
Suddenly the shepherd saw a hairy man quite close to him (3-4 meters) and a little below. The shepherd observed it during about two hours, and it did not see him and did not feel his smell. It was a young male of medium height (170 - 175 cm). It sat in the sun “as Moslem” with crossed legs, and ate larvae of ants. It took them by two fingers - thumb and the forefinger. Its eyebrows were large, wide, and protruded. The eyes were of dark color and similar to those of human. Ears had man’s ears form but hairy. It had no forehead, the neck was very short. Its mouth was wide and the lips were insignificant. The following the most recent message from Kashmir allows to connect western and southern boundaries of considered inhabitance area. Observation 10: From communication of Karalanext.com news agency, India, January 10, 2003. - There is no mistake about what I saw. The monster had the face of a man with monkey-like features. It was extremely sturdy. It was the Snowman. Let's proceed now to Mongolia, to Eastern borders of the area. Observation 11: From the manuscript by Djugderiyn Damdin that was received by B.F.Porshnev in 1967. The story of 56-year-old Amardjargan Choidoo, the employee of agrarian station of Mongolian Academy of sciences in Kobdo aimak. Choidoo rode by camel at mountain Almasyn Ulan (to SouthWest from mountain ridge Bayandor) and saw something white that laid in the bushes. Choidoo went there and found the corpse of a human-like large animal, covered by hair. The animal was lying on its side with raised hand, leg, and head, it was stiffen. The corpse was very similar to human, but clearly not a human kind. The part of the hair was separated and scattered by wind on sand. One more encounter from Mongolia that gives interesting information on feeding of the hominoid. Unfortunately, the place of event is specified too approximately as "in the Eastern Mongolia". Observation 12: From the letter by F.Abitov to newspaper Komsomolskaya pravda. I worked in Mongolia during 1976-78 as car driver. Once I had lost the right way, and left the car to study the place. Unexpectedly I saw two people. I thought that they were herders and run to them. But when I was nearer, I saw that they were hairy. They gathered grass and ate it. When they noticed me, they stopped to eat. The taller of them let out a cry like horse neighing, showed its teeth, and they left upwards along the valley. The location where they live is in the Eastern Mongolia. I have also some more records of valid encounters, which took place in the area. As a result we have a rough notion about living area of alamas-like primates. It is outlined by dashed line on the map Fig.1. In general, the alamas-like primates live mostly in deserted dry districts at highlands and lower heights, covering vast territories from Himalayas to the edge of the Asian forest zone and from mountains of Central China up to the Afghani deserts. In a number of places they coexist with large hominoid forms. In other cases, probably, the short hominoids expansion is restrained by the gigantic forms, such as Chinese "Yeren" at the Eastern and Afghani "Dav" at the Western borders of the area. Fig.1. Inhabitance area of short alamas-like primates. 1. Trachtengerts M.S. Unknown primate in Himalayas. The Integrated Scientific Journal, ¹20 (43), 2002, p. 30-35. 2. Trachtengerts M.S. Reconstruction of alamas head (external appearance). Natural and engineering science, ¹3, 2002, page 38-42. 3. Izzard R. "The Abominable Snowman Adventure", London, Hodder & Stoughton, 1955. I thank Dr.Anatoly Yakovlev who had read the article and made useful comments.